"People often ask me why I enjoy fishing, and I cannot explain it to them because there is no reason in the way they want meanings described. They are asking a man why he enjoys breathing when he really has no choice but to wonder at its truth." 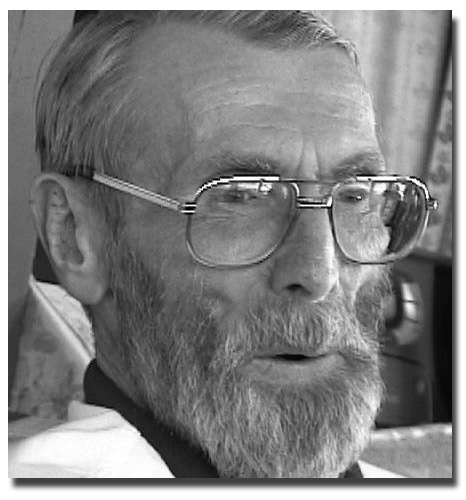 I first learned about Al Stewart from a man who fishes out of Center Harbor, New Hampshire. He claimed that this hardy man and his wife, who live in a cozy little solar heated cottage built on the rocks of Little Two Mile Island only a few hundred yards from one of the Lake's hottest salmon and laker holes. I heard the story, later confirmed by Al, that one spring Al and a party of angling friends came to fish and stay at his cottage. They carried little to eat, being over confident that they would catch their supper. The story goes that they did, indeed, catch a mess of nice salmon. Al Stewart, who has no waste disposal on his small island, decided to efficiently clean the fish aboard his small boat. He skillfully did this, placing the guts and skins in a yellow plastic bucket, and the nice fresh filets in a tin one. Al Stewart kept trolling, while he performed his fish cleaning chores, until he had a nice strike and boarded and released a good 22" salmon. Being very excited by the thrilling battle the fish put up, Al was eager to head in with dinner. He quickly dumped over board the contents of the tin bucket and headed in with the yellow bucket of fish heads and guts! Since that time, his friends joke that if one wants to catch already filleted fish, troll just off Little Two-Mile Island! In 2003, when I visited Al Stewart on 2 Mile Island, I was sad to see that he was connected to an oxygen pump. 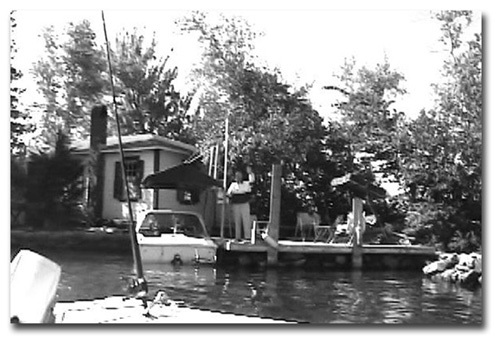 But I soon learned that he had 4 small 2-hour portable pumps that he could take out in the boat while fishing. He told me that one had failed to work while fishing and he had to rush back in and connect to his big machine on the island…where, he has only solar power except for a portable generator. That's angling dedication! "We will probably not be going back to Little 2-Mile Island this coming summer because of oxygen logistics and other infirmities which keep us close to home…. Too bad and so sad after more than a 56 year association with Sandy Island Camp, Little 2-Mile Island, and beautiful Lake Winni, New Hampshire…." 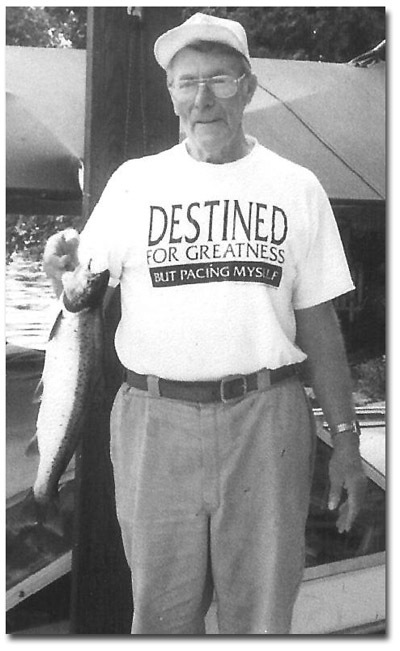 In the summer of 2004, friends gathered on the shore of Sandy Island for a fitting final tribute and memorial service for Al Stewart in honor of this fine husband, father, grandfather, friend, and angler and his wife who passed on within months of his passing. Number of years angling in Lake Winni? Who taught Al Stewart to fish here? "Lewis Derby, my young protégé who was a salmon fisherman." Who is the fishing hero/mentor of Al Stewart? 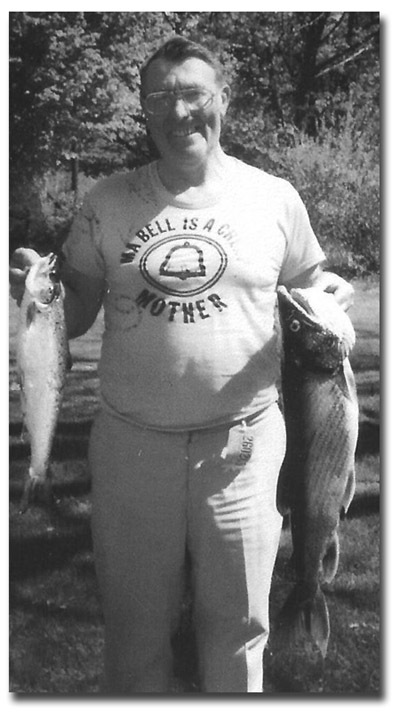 "Chuckie Gordon from Dalton, Massachusetts, who taught me how to fish for brown trout both trolling and still fishing." What were the principal things you learned from him? "How to thread a live smelt or shiner on a line with it still alive.How to play a big fish so he would not break your line." "Salmon. Best eating and fighting fish in the lake -- lots of action and a very smart fish." Which does Al Stewart prefer, lead core, fly rod, or downrigger fishing for salmon and trout? "I prefer lead core as with the higher tech downriggers, I am forever getting hung up!" Favorite fishing months of Al Stewart? Best time of day to fish? "Early in the morning. Fishing is dead after 11 AM." 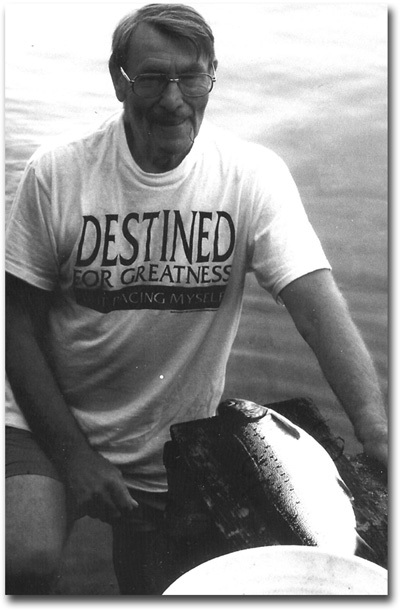 Largest salmon, laker, rainbow and bass Al Stewart has caught in Lake Winni? Al Stewart can you share your stories about these monsters? "I had to play the 10.5 monster trout for 45 minutes before he tired out and came to the net. I had only 6 lb test line on my 30' leader." Has Al Stewart passed on to others your angling skills? "Yes, to my son, Rob and grandson by taking them fishing very often at an early age. My son is an excellent fisherman now." Top 5 tips for salmon by Al Stewart? Don't use snaps or swivels beyond the end of the leadcore line as the fish can spot them. Keep trolling speed as close as possible to 2 MPH. If you have a decent fish on, reel in all other lines and keep them inside the boat. Then slowly play and land your fish. Patience - play your fish until he is tired and then net him. Top 5 tips for lakers by Al Stewart?" I try not to catch lakers and if I do I release them, with the exception of my one trophy laker which was caught on a live shiner and very small treble hook." Top 5 tips for rainbows by Al Stewart? "Rainbows are, for me, just a matter of pure luck. I do not purposefully fish for them, but every now and then a bonus rainbow hits my line." Does Al Stewart practice catch & release? "Yes, some of the time. Smaller marginal fish and all lakers are released. And some get eaten." 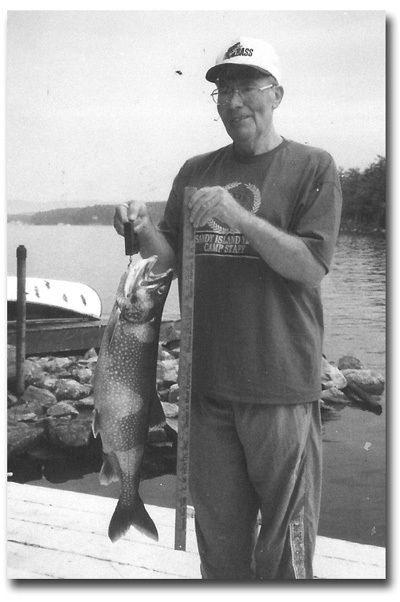 If Al Stewart was NH Commissioner of Fish & Game, what initiatives would you take to improve Lake Winni angling? "Let well enough alone. The salmon catch has been steadily improving in size and quantity so the Fish & Game people must be doing a good job of keeping the right balance between salmon and smelt. I would not favor the introduction of any new species." Favorite fishing stories of Al Stewart? "Three of us were fishing. We had 6 rods all with Davis spinners and live bait - quite a few rods! Bingo! We got 6 hits all at the same time! We each caught them. By the time the chaos was over, we had 6 fish flopping around in the bottom of the boat -- all with treble hooks in their mouths. What a joyful mess!" Why does Al Stewart fish? “During the Great Depression, money and food were very hard to come by. 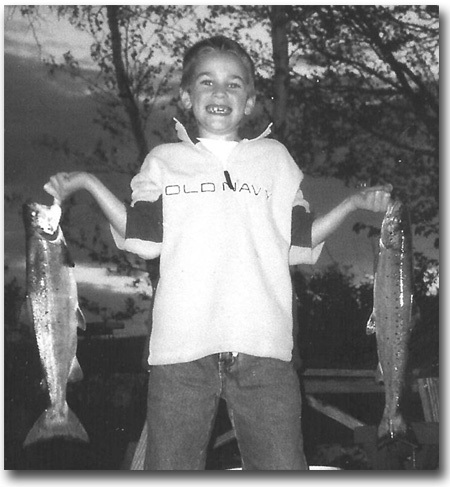 At the age of 8, I began fishing and digging clams to put food on the table for my mother and 3 sisters. We ate just about anything I could catch or dig. This became ingrained within me. "Thirty years later, I bought a new 14' runabout. In order to partly justify spending the large amount for the boat, I started fresh water fishing for perch, trout, and horned pout. We also used the boat for our recreation and camping trips to Lake George and Winnipesaukee. 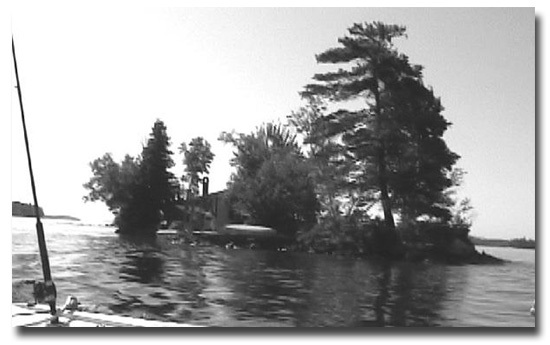 "We bought Little 2-Mile Island on Lake Winni in June 1969. The following year I was hired as the camp carpenter at Sandy Island and my wife was hired to run the craft shop. We worked at Sandy Island for 35 years and our 4 children also worked there for several years. "We commuted daily by boat from Little 2-Mile Island to Sandy, about 7.5 miles each way. What a great life! 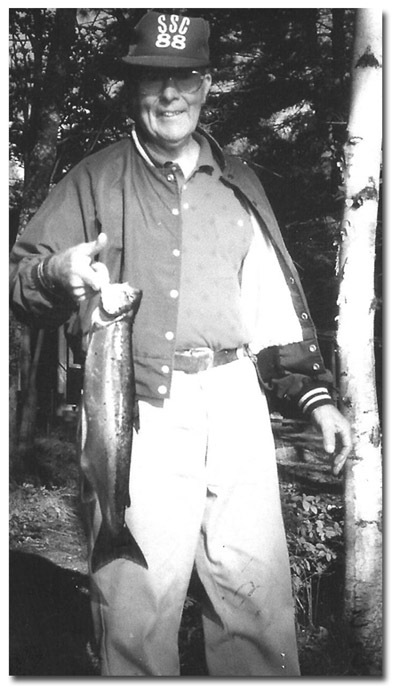 “My young friend, Lew Derby, taught me how to fish for salmon and trout in Lake Winni. We troll at 1 3/4 to 2 MPH or 600 RPMs. Most of the time we use leadcore with a 30' 6 lb test leader and a Maynard's Marvel streamer fly. 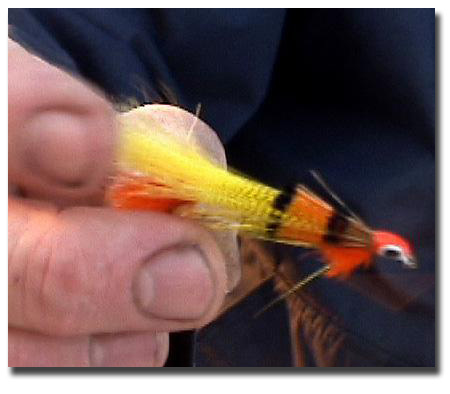 "We have had great success over the years with this fly. I would like to use live bait, as I believe it is better than the imitations, but it is too much of a hassle to go ashore, get in the car, and drive to Meredith to get it. 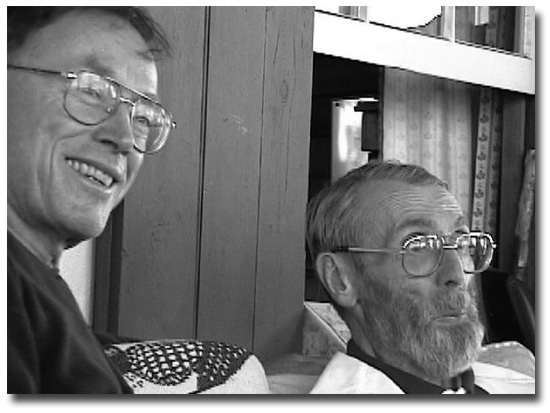 “Over the past 30 years, Lew and I have shared many more triumphs than disappointments. My son, Robert, who lives in Gilford, New Hampshire, is also an excellent angler, and we have shared many happy fishing trips together. 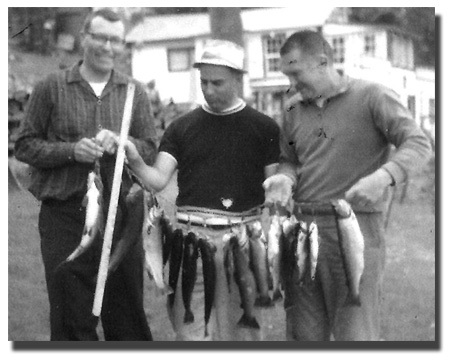 "Bob, Lew, and I have fished in snow, sleet, rain and ice as well as many days of rough water as well as calm sunshine. Bob and Lew use downriggers, but I do not. Every time I have tried these high tech downriggers, I have gotten into a mess - so "Humbug" I say to downriggers! “I have always lived in a house full of women with the exception of the years when my son was growing up, but then he and I lived in a house full of women! I still live in a house full of women, so fishing is a good way to get "out with the boys" once in awhile for some male bonding." Best day of fishing for Al Stewart? "It was on July 30, 1994. I started at 5 AM trolling with two rods, each with a Penn Reel with 100 yards of 40-pound test leadcore line and 25 yards of monofilament backing. My leader was 30' of 6-pound test monofilament. "I had strung on a live shiner in my secret method, which I guess I will share reluctantly in this book. I use a very tiny treble hook hooked through the shiner's back so he can swim freely. "When my big fish struck that morning, at first I thought I was hung on bottom. I took the motor out of gear, then looked at the depth finder. It read 70 feet! Quickly I put the motor back into gear and began reeling in the other rod, which had no fish. "Meanwhile the rod with the fish was clicking off line - the sweetest sound in the world! After bringing in the empty rod, I shut off the motor and concentrated on landing the big fish. I knew that he must be very big by the way he ripped line from my reel. "I set the drag for what I guessed to be about 3-4 pounds of pull and proceeded to work the fish. After awhile, he would come part way in and then rip off another 10 yards of line … and so it went for about 30 minutes or so. My arm was tired. "He finally began to tire as well to the point when I could gradually reel him in. As he approached the boat, I couldn't believe his size! My net was old and I was certain that he would break it. But at the end of our 40 minute fight, he was so pooped out that he could not even flip or flop! "Once I got him in the boat, I weighed him. 10.5 pounds and 31" long! What a thrill to catch this biggest fish of my angling career! “Since I was alone and had no one to brag to, I couldn't resist going over to the only other boat I could see in the area and showing off my prize. I then went home to Little 2-Mile Island and had my wife take a bunch of pictures of me with my fish. "Next I cleaned and filleted him, and into the freezer he went to feed some hungry mouths! On the ocean I have caught several striped bass that were much bigger than this fish. But that was done with steel wire and lots of muscle, which required no finesse whatsoever. But getting a 10 1/2-pound laker on a 6-pound test line is a proud accomplishment! “Here's how I rig up a shiner, minnow, or smelt for trolling: I make a 4" long threader out of piano wire with a very tiny hook on one end and a handle loop on the other. I insert the piano wire into the fish's mouth and push it through his digestive tract and out his vent. “I hook a 2-foot leader onto the piano wire hook by a loop in one end and pull it back through and out his mouth. I then attach a very small treble hook to the end of the line coming from the shiner's vent and insert one hook of the treble hook through the fish's back just behind his dorsal fin. "Where the leader loop comes out the fish's mouth, I attach it to my 30' 6-pound leader on my line. Rigged this way, the shiner swims normally when I troll him behind my boat at 1 3/4 to 2 MPH." Favorite Al Stewart recipes for cooking Lake Winni fish? “My wife cooks both salmon and lakers the same way. We put a whole fish filet in foil, sprinkle it with lemon and/or white wine, salt, and pieces of butter, (bigger for bigger fish) (1 quarter pound of butter to 2 pounds of fish). Close foil and cook over grill for 10-15 minutes until done." Is Al Stewart concerned about mercury levels in Lake Winni fish to the degree that you restrict your fish intake?